Using someone else’s site entirely – a web 2.0 network, for example. Using expired domains is the quickest way to see an impact from building your own private blog network. By selecting the best domains you can find in your niche you can enjoy backlinks you may never have earnt by yourself. If you can score niche relevant domains with strong, authoritative backlinks from traditional media or the kings of your niche you could be onto a winner. Real domains with real links cost money – but their value can continue to deliver for years. There are two main schools of thought when it comes to buying domains. You can buy at expiring domain auctions or hunt for expired domains yourself. Tens of thousands of domains expire every day – though sadly the majority are worthless! The main domain registrars collaborate to maximise the profit they can make from expiring domains by auctioning them off to the highest bidder. Chances are if a domain is worth anything at all it will end up going to auction. There are three main auction houses: Godaddy, who as the biggest registrar on the web tend to auction the most domains, as well as Namejet and Snapnames. Each of these companies release ‘droplists’ – large CSV files – of domains and the date they are due to expire. These are huge and difficult to work with at home, but some useful services such as Freshdrop, Domcop and others have sprung up to help digest the data. We love Domcop, as it uses a wealth of information from Majestic, Moz, SEMRush and more enabling you to make an informed decision on the domain you plan to buy. Do you need more relevance or authority? You have a site and you have plenty of links from both within your niche and without, but you’re lacking that ‘wow’ factor. In this case you need to aim high – look for a domain with a minimum of TF25, maybe higher. Ensure it has 100s, not 10s of links. Double check those links are genuine and not from paid links, spam or other junk. Niche wise you can afford to be more relaxed: aim for a generic domain such as an ex media site. If you’re lucky and you’re in a niche such as health, tech or another link-heavy area you can probably find a strong, niche relevant domain. But for the rest of us, a blog or media site that packs a punch will suffice. One word of caution though: don’t buy on metrics alone. Always dig in and take a look at the backlinks in detail, especially if you might be about to drop $500 on a domain at auction. It’s not uncommon for Majestic to be confused by a handful of high TF links in a sea of spam. For example, we’ve seen many domains whose only ‘trusted’ links are from a single blogspot splog post. Majestic often shows blogspot.com, blogspot.co.uk, blogspot.de etc as independent domains. This inflates the trust flow on paper, but likely doing nothing for your prospective domain’s power. See more tips on Due diligence when buying domains below. Does your site not fit into its niche? If all your links come from generalist directories and blogs you need to prove to Google you are relevant to a query. The best way to do this is by finding more links from within your niche. Often this will mean you need to relax your expectations when it comes to metrics. Otherwise, you will find it hard to find enough domains relevant to your niche that have enough power. Where once you may have aimed for a trust flow of 25-40, you might now only be able to source those in the region of TF10-20. This overview is helpful, but we would recommend drilling down. It is important to analyse the referring domains of any domain you wish to buy and making sure there’s nothing unusual there. 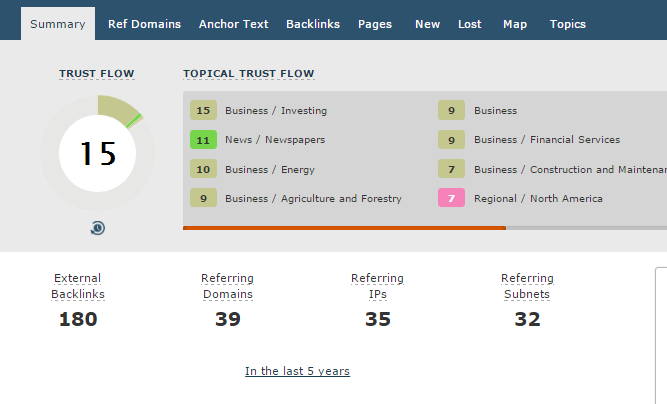 In this case our domain checks out - the majority of this domain’s top backlinks are clearly biased towards business, finance and investment so in this case I would be a buyer. If you’re just looking to bulk out your anchor texts and raise the number of unique linking domains you can be less selective. But you should still try to avoid buying spammy domains. Do also consider whether the ROI is there. Given you must pay for content, hosting and development, is it worth buying a bargain domain? Or would it be better to spend an extra $10-20 on a domain with more value? There's no clear rule of thumb here, but personally given the costs of hosting and renewing a domain over the long term - and the fact that all domains will lose links over time - I won't buy a relevant domain with less than 25 linking domains and TF8, whereas if I'm less concerned with relevance I'd set my floor higher, ideally looking for a domain with a minimum of 50 linking domains and a tf of 10 or above. GoDaddy runs a simple auction and you can bid from day one to the closing date. Easy, right? Except for one catch: the domain hasn’t actually fully expired yet, and it could still be renewed by its owner. Once you’ve won the domain auction you must pay with 24 hours. You may still have to wait for a few days until you know for sure that it is yours. In fairness, this hasn’t happened to us yet, but we do hate to wait. The advantage with Godaddy is the lack of a minimum bid. This means if you’re shrewd and don’t get too attached to one domain you can pick up reasonable domains for just $12 (+ the reg fee). This does take patience and planning, but with persistence, you can score some great names at a knockdown price. NameJet and Snapnames offer a ‘pre-release’ period where you can register your interest by placing a minimum bid. If you are the only bidder you win the domain outright – sometimes for just $69, including the reg fee. But if there is more than one bidder the domain goes into a private auction. Once the auction closes the domain goes to the highest bidder. If nobody bids above the minimum, the user with the first bid on the pre-release domain wins. With all three auction houses, auction sniping is supposedly impossible. If you outbid someone in the last 5 minutes of an auction the auction is extended by five minutes. In practice though, few people will get the outbid notification and log into their accounts in time to win the auction. With luck, you can walk away with some choice domains while avoiding getting sucked into a bidding war. It’s easy to start overvaluing domains and in the thick of a domain auction you may end up bidding above your budget. We recommend setting a rough guide price of what you are prepared to pay per domain. Don’t forget the additional costs: privacy, domain registration, renewals and your PBN hosting. Is it really worth buying a $10 domain when it will cost you $5 for privacy, $15 to renew and $15 to host for a year? Or should you focus on a higher class of domain and a lower quantity? We love 5* domains but find it’s easier to get emotionally attached. It's easy to blow your budget on what, when it comes down to it, is just one link. It’s great to have a few in your portfolio, but it’s easier to build fast at the 2-3* level. This allows you to find a balance between quantity and quality – and increases the choice available to you. In practice however scraping is both time consuming and fairly frustrating, with an ever increasing number of people chasing an ever smaller amount of domains. There are some tricks to building a seed list that is linkrich - think of resource pages and other places you may have lists of many older links per page - and so likely to yield more relevant or trustworthy domains - but we see crawling as more useful to those who know they need a network of 50 or more domains. Realistically, to find a decent number of domains of any real quality will require a dedicated server or VPS crawling constantly to fill a network. This adds a monthly cost as well as the cost of a scraping tool itself - and Majestic or ahrefs credits for sorting and analysing domains to ensure their quality. If you're simply adding 20-40 links to your network you might find the time involved in scraping effectively is hard to justify - it may be worth trying to get domains at minimum bids or closeouts at Godaddy. Expired domains pack a punch and come preloaded with juicy links, giving you a head start when it comes to boosting your sites. Yet they are not without their drawbacks. Expired domains can be expensive. Whether forking out at auction or for a scraping tool, they costs can add up. Even the time you spend manually seeking out quality expired domains yourself needs to balanced against paid work. They can also come with considerable history – not all domains with great metrics will result in a great network link. You may find a domain has already been part of someone else’s spam network and devalued. Many others will have been blasted with spammy links for fake designer clothes or Viagra. Worse still, the domain may have already been deindexed – or a deindexing may follow soon after purchase. We suspect Google pays extra attention to a domain and how it may change in the weeks after it has changed ownership or dropped and been renewed. All of these issues can be avoided by starting a network of fresh domains. The obvious downside being that those fresh domains start with zero links of their own. It’s not just the technical downsides either. There are some niches with countless websites being made or dying off every day – and others with just a handful. If you’re in a niche where relevant expired domains are like hen’s teeth you should consider starting a network of niche relevant pumper sites you control. The aim of building a network is to build quality links to your own money sites. There is no sense in leaving your fresh domains without any links of their own. You need a strategy to improve the authority of these domains so they can pass benefits on to your money sites. This is what stops many people from pursuing this tactic. But in truth, it needn’t be as big an obstacle as you might think. The advantage of using fresh domains is similar to that of using any T1 as a buffer for tiered links. While you will want to blend in some niche relevant links too, you can bulk them out with lower quality links you might be afraid to use on your own sites. This means you can be laxer with link quality than you might on your own sites. Directories, blog comments, forum profiles, web 2.0s and even software generated links or dodgy foreign link networks may be acceptable approaches, depending on your level of risk. This approach will take longer to deliver effects than buying brand new domains. But the benefits of truly relevant links can’t be understated. If you get your on-page right so your sites look legit, you should stand a much lower chance of being detected or deindexed, and you may even reach that holy grail of links that send relevant traffic too.